At least one ER doctor thinks so. David Denton Davis MD, a former Emergency Physician, claims neither our Centers for Disease Control (CDC) nor our Department of Health and Human Services (HHS) has requested help from the American College of Emergency Physicians (ACEP) in identifying illnesses and deaths occurring hours, days and weeks following childhood vaccinations. In his soon-to-be-published book “Who Can Parents Trust? Vaccines: Avoidable and Unsafe,” he claims the vast majority of serious vaccine related illnesses coming into Emergency rooms will continue to go unrecognized, unless nurses and physicians ask the last vaccination date (LVD). He believes during the past thirty years several million serious Adverse Events (AE’s), including deaths presenting nationwide to more than 5,000 Emergency rooms have never been recognized, documented or submitted for investigation, in accordance with our National Childhood Vaccine Injury Act (NCVIA). All suspicions of a vaccine related adverse event are required by law to be submitted using our Vaccine Adverse Event Reporting System (VAERS). Sadly, he goes on, very few Emergency Physicians or Nurses have received any NCVIA or VAERS education. 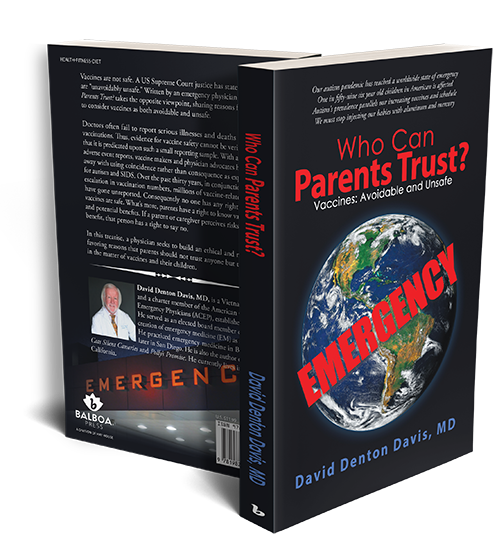 As a charter member of ACEP, Dr. Davis served on the Board of Directors during the creation of Emergency Medicine (EM) as a specialty. He admits his own reporting failures were due to a lack of vaccine education. Dr. Davis states he is concerned many pediatricians know, but are not reporting illnesses following vaccinations, for financial reasons. Although neither makers nor physicians are liable for vaccine damage, the ultimate truth for safety was made contingent on investigating physician, parent or third party VAERS submissions. With only a very small percentage being reported, no one can honestly say vaccines are safe. At a time when our vaccine industry is rolling out newer and, perhaps, more dangerous products, he believes it is time to call a temporary halt. He claims the millions of missing VAERS submissions may still be found, perhaps hidden, in insurance company files. He carefully and skillfully points out doctors who choose to ignore previously reported mild vaccine reactions, such as a fever, may be deemed liable for more severe events following future injections. In addition to pointing to ACEP and insurance company reporting failures, he adamantly questions the morals and ethics of physicians conducting vaccine studies on extremely low birth weight (ELBW) infants in Neonatal Intensive Care Units (NICU’s). He repeatedly questions how many more NICU infants need to be injured attempting to prove vaccines have no adverse consequences? He asks what has happened to those who have been injured. A Supreme Court Justice has stated vaccines are “unavoidably unsafe.” Based upon failures to report and evidence from NICU’s, Dr. Davis’ opinion dramatically differs. His focus is on aluminum, a nervous system poison, which is present in most vaccines. Studies throughout the world are attributing injected aluminum to sudden death and long-term neurological disabilities including Autism Spectrum Disorders and Alzheimer’s disease. No parent should consent and no doctor, under any circumstance, should continue ordering this avoidably unsafe metal being injected into newborns, infants, children, or soon-to-be teenagers. He does not expect help coming from insurance companies, even those federally funded for our medically indigent and elderly. If they intended to comply with our childhood vaccine injury law they would have done so long before now. Therefore, he intends to pursue an ACEP resolution supporting vaccine injury education and VAERS submissions at their meeting in San Diego this year. Learn more at Dr. Davis’s website here.